We normally find party and formal gowns and accessories for parties and occasions normally held in February and March where students are enjoined to have their proms and graduation balls. So, my sister did purchase new gowns to replenish the drained supplies. To show off the stocks, I normally change our display window to color variants of gowns, dresses, and stuffs. At least, the bypassers do check the stock and if we get lucky, we make sales too. But, I hope that when I shall visit my sibling in her place, I can locate more good stuffs. I can in her old place since her new condo is still on process. City living is quite nice but the houses simply are pricey. At least, one can check on their average costs and home insurance that can go with them. I can only hope for finding the best picks at lowest rates since buyers still consider price tags among other things. This economic recession really makes life in the Philippines harder. In celebration of Kalilangan 2010, the city government of General Santos held a beauty pageant. The pageant was conducted in one of the city’s grand mall and we were only prouder to witness lovely tribal costumes of T’boli, Bilaan and the Muslim tribes. We were quite awed with how a very ethnic fabric and accessories could look so grand on the contestants. The city shall have the pageant's coronation night soon as the festival commences on Saturday. It is quite difficult to search for fashion apparel and accessories for someone who has physical disability, temporary or otherwise. When I got a sprained ankle, I had to wear elastic badges on my foot and could not even wear my usual shoes, not to mention, I had to work with crouches. LOL! Further, when one is extremely big, apparel is quite a struggle to find. So, I commend establishments which at least offer, handicap - friendly facilities and apparel. At least, they make the disability less imposing. I don't want to see my loved ones sick or at least feel uncomfortable. So, when a very dear loved one - colleague who weighs quite big in spite of her age could not walk well without her cane, it made us wish we can do more for her. Further, she suffers from extreme rheumatoid arthritis that she watches over her diet. I wish to introduce to her golimumab to address her joint pains and make her retirement more relaxed. Her clothings would have to be pre-made since there are no ready - made RTW's that will fit her weight and structure. Just recently, I had to buy nice comfy sandals for my nephew since he has these nasty wounds on his foot that he finds it difficult to wear on footwear other than slippers. So, I wish some stores can be sensitive to people who have special needs. Another Korean actor I adore is Rain who recently made nice Hollywood films entitled Speed Racer and Ninja Assassin. I first watched him in a drama series, Full House and since then, I never stopped looking out for his films. I do love romantic comedy stints, so his movies normally fit in my movie likings. He is quite cute and a nice athletic bod. LOL! But, he is well known for his singing career and now into acting, business and modeling. I simply find this actor quite a yummy talent! hahhahah! We are now on the verge of getting our fashion mall boutique constructed anytime soon. We thought we would have this done late last year in time for holiday hypes but for some reasons, it got delayed. We are still waiting for the approval of the mall on our last revised floor plan and then, we can continue with the other papers and finally have this space constructed. The space is about 15 square meters and my family member had installed dressing and stock rooms among the basic requirements. I wish to have a dirty room for dining with comfort room and Kohler faucets for convenience. I hope that once we have the mall stall going, the sales will be better otherwise all the expenses will be in vain and that the forecast I had made shall be useless. This shall be in time with the new stocks that shall be coming. Good luck to us! For now, I shall settle with rearranging our display window for some lovely picks. Forgive my usual posts here but I am quite a big fan of Korean dramas of my personal favorites. I have featured Yoon Eun Hye, and Lee Min Ho but I wont miss featuring another favorite, Gong Yoo. I have seen a number of his films including She is on Duty, Spy Girl, Sea Biscuit Teacher and 1st Shop of Coffee Prince. I like his acting skills, his face and his fit bod. hahahhahah!!!!! So, here I am only happier that I get to have two of my Korean favorites on one film. See the clip below from Ist SHop of Coffee Prince. I find this film funny, romantic and simply one of the best. For us here in the Philippines, who won't adore Lee Min Hoo aka Goo Jun Pyu in Boys Over Flowers drama series aired in 2009? This is one of the drama series that I won't get over with. Gosh, I think I have seen this film more than three times. My kid and I just have fun viewing and reviewing this film. But, most of all, I quite find this young man, so handsome. hahahhahahh!!!!! Gosh, I seem like a salivating teenager. Yikes! I first saw Yoon Eun Hye in Princess Hours and since then, I am hooked this quite talented Korean actress/singer/model/entertainer. And with this adoration, I viewed n times her other films and korean drama series: The Vineyard Man, The 1st Shop of Coffee Prince and her most recent, Take Care of the Lady Castle. This lady is only 26 years old but she has indeed capture global interest because of her talents, beauty and wits. No wonder, she has won renowned awards for her stints. She is simply a beauty and no wonder she is oftentimes selected for product endorsements and runway. Don't get me wrong, but I am a teacher and for eleven years and still counting. But, as part of the code of ethics for teachers, we are supposed to wear only decent and conventional fits that would depict a character of professionalism among other things. But, I am one of the unorthodox in fashion. I quite believe that teachers should be presentable without looking like a geek nor a neighbor next door. Should I be ban from school for this? Hahahahahh! I hope not but I am happier when I look and feel better. Somehow, it motivates students that teaching is a happy job that one can always be inspired to look forward to the next day. And with that feeling, one can be happy about mix and match of outfits. Teaching is quite draining that I wish I can have more vacations like ski vacations to recharge my energy. So, come this summer, I shall be off for my long overdue vacation to Manila with my sister. When I was a fulltime teacher, I wore my school uniform but sometimes, I don't like the pale colors that it could make my mood gloomy and dragging for teaching. LOL! Whatever the job or career we pursue, it is imperative that we are happy with our work otherwise even the grandest outfit can't make the difference. Two days ago, I decided to have a new look from my usual long hair with no bangs. I wanted to try something new since I found my own hair style dull and boring already. So, I dragged my sister to the parlor and had the V-cut again but with layered bangs to give width to my oblong face. Everyone said I looked younger although, the new hair cut makes me edgy and conscious. hahahhahah! But, in the coming days, I shall get used to the new look and just glad, I had the hair cut. gem - beaded hair loop that can come in different colors to complement shoes and bags and outfit. I normally wear pony tail loop on my long hair and sometimes a bob pin but in General Santos City, gem - studded hair loop is IN. I got this accessory from my sister, Tammy who had varying colors and styles. With a green - sparkling headband, I pair this with complementary fit. When I look at beauty, I try to see if it looks on anyone, and since these bands quite amaze me, I basically have three other styles. LOL! This liking goes with seeing people on sundress or on pants, or with loud and bold accessories. Further, it may also include seeing someone who is well - toned and not too much of muscle builder that I wish I can be that person. The thing with accessories is that, it is supposed to highlight your good points and not be too flashy or overdone. So, to keep me aware, I count the number of items I wear including my outfit and if they are more than 10, then I have to let go of other unessential items. I think my high school friend gave that tip ages ago just to know if you are overdressed or not. If this is really true, then I can only comply but if not, then to hell is the tip. LOL! Last December 2009 because of boredom, I did have my hair waxed and colored to burgundy. I stayed almost two hours in a parlor, and had sure liked what I saw. But, how I wish that fast pace can also be applied to losing weight. Sigh! There are indeed various ways to have slimquick but I do prefer non - surgical and non - medicinal. But, the weight - loss ordeal is too slow and tiring. Experts say metabolism becomes slower when we age that exercise and diet don't seem to have a remarkable effect. I am indeed bored with the bulges but I could not do much other than going back to my jogging, or biking and tremendous dieting. I know I have to muster all efforts to wake up early and hit the running track and contain my desire for additional meals or snacks. Oh, help me God! With my sister Tammy, SHeng, and Gensan beauties. My face shapes like an oval or oblong and I quite it dislike it before since I would prefer to have a heart shape or a square type. But, after ages of self - esteem building, I pretty love what I look like. But, ages ago, I usually wear a neck - length hair cut with a quite plain style and bangs to complement. Somehow, this had been my cut until I got married. Now, I sport a layered long straight hair. I normally receive good praises, so I am confident that I did the right thing for the hair, at least. to see the photo gallery of other hair styles, tips and tricks, click here. OMG! again has given us their album of celebrities whom they think made the wrong again. But, from their list, I highly agree on Mariah Carey's mistake. I got this from Youtube although I would agree on who were categorized as worst or as best, I would disagree on others. So, you judge for yourself. Vanity seems common not only among women but also among men. But, how far can you go for beauty? With a lot of health issues, people tend to look for alternatives to fit their health into their lifestyle. Ideally, it has be the other way around but with fast - pace lifestyle, even health is usually obscured with so many things like deadlines, pressures and alike. Thus, the word detoxify is quite popular that food and beverages seem to carry this label as their flaunting banner. I know I have to exercise to at least improve my bone condition but how do I detoxify exactly? Whenever I can, I go back to jogging and mountain biking and when I am full, I drink tea. Do they work? I think so. So, other health - conscious people do consider body detoxification including colon cleanser to at least keep them fit. People may say we overdo this health consciousness, but I pretty believe on the old adage, "Prevention is better than cure!" So, am I vain? I don't really mind. Miss Philippines - Earth for 2010 search is now accepting candidates for the most renowned Miss Earth which will be concluded in Vietnam. Miss Earth is one of the globally acclaimed beauty pageant that is centrally concerned with environmental awareness. Last 2009, Ms. Brazil Larissa Ramos was crowned as Miss Earth 2009. It is the evening of Valentines' Day and I am sure overwhelmed by this occasion like everyone else. I was waken up earlier by roses handed down by my husband and kid and that really made my day brighter. I did help my kid with his exam reviewers for Monday and joined him in his badminton. It was a nice day indeed. But, the day did not end since we headed to Robinson's for the unexpected ferris wheel ride. Whoa!!! LOL! The malls were indeed packed with wandering and dining lovers and groups. They were filled with red decors, cupids and stuffs with all sorts of party dresses. I bought some personal stuffs but missed to have the shoes I previously set my eyes on and the acne cream that I badly need. Next time, I shall see something nice, I shall buy it promptly so not to miss it next time. LOL! The entire family, after my sibling went to their separate dates, joined us in a sumptuous dinner in a local diner . The day is truly sweet and nice that I wish my other sibling in Manila could have joined us. My oldies would surely lovely the dinner more. But, happy happy valentines anyway everyone! As a freebie from the diner, I get to have a lucky leopard stuff toy. Cheers! We watched Pinoy Big Brother (PBB) Big Night when 2010 big winner was announced. We are only prouder since Melai, the big winner, is hailed from General Santos City and our entire city is simply rejoicing with her triumph. But, I quite loved and adored the hostess' gowns and Melai's fit. So, I found this Youtube segment of the big night. Enjoy! The entire nation is hooked to the culminating night of Pinoy Big Brother. The Generals or folks from General Santos City are indeed anticipating a good bet on Melissa as one of the Big Five. We are quite proud of Melissa who in spite of her dull and ordinary looks, she has captured the hearts of many Filipinos. Our city Mayor Pedro Acharon even enjoined his constituents to vote for a fellow General, Melissa to be the grand winner of this nationally acclaimed reality show. For 19 weeks, they were house arrested with various tasks and painstaking ordeals. Melissa is the only lady in the Big Five. So, we are only prouder of her endurance and tenacity to make it to the final night. I wonder how she had endured the struggles of PBB and if she tried any relaxing schemes or womens vitamins to make it through. I was never a fan of PBB but the entire family is only happy that General Santos City again shines. So, regardless of the contest results, Melissa is already a big winner for the entire Generals. 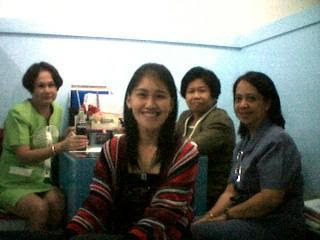 With my fellow administrators - friends from old school, Pilar College. They were my seniors and quite serious too that I looked like a silly sibling on fancy fit. LOL! In my most recent school, three supervisors of mine observed my teaching instruction in three separate occasions. Gosh! I never experienced a more difficult teaching experience than being grilled. LOL! I was a college faculty member of Notre Dame of Dadiangas University (1998-2000), STI (2000-2001), Pilar College (2001-2008), Ramon Magsaysay Memorial Colleges (2008-2009) and now back to STI(2009-Present). But, since I only work as part time teaching, I feel free to wear practically anything decent. But, when observations are unannounced, I can only do better with my teaching but can't do much with my outfit. So, when my direct supervisor showed the results of the observation, I did remarkably in terms of teaching but had the anticipated remark of improper uniform. LOL! My usual getup only includes slacks and a blouse in various colors with complementary bags and shoes. My lady students would sometimes ask me where I get my stuffs, I only tell them, from my boutique. LOL! I have been watching movies today that all have pregnant women in them. Don't get me wrong but I am not at all pregnant. I just remembered the ordeal I went through when I had my baby. Geez, the pain was hell! LOL! But, my in - laws helped us a lot my sending us some magazines like Parents and Housekeeping to help us with the kid and all. Somehow, the tips were all handy when they are highly needed. I missed taking pregnancy vitamins although I had my prenatal checkups but somehow, I found the pregnancy experience difficult and nasty. But, having my kid is the best of my life and the pain was all worth it. However, I don't want to go through that ordeal again that I disposed all my maternity dresses, baby clothes and gadgets. It however, it brings much delight to see babies and pregnant women. They are simply too beautiful to be ignored! You love to communicate to and relate with others. Sharing stories and experiences is one of your favorite things in life. You are an open and easy going person. You don't have many hang ups or inhibitions. You are who you are. Your energy level is pretty high. You tend to be fairly calm when you're alone, but being in a group really makes you spark up. Your signature latte would have the works in it. You're not above putting in a couple types of syrup and whipped cream. And heck, sprinkles too! What a poor title but red is my fave color. Feng Shui even recommends that orange, maroon and red shall bring me good luck. With or without Feng Shui,, I simply love red. Somehow, it signifies confidence, joy, and courage. But, February is a red month for everyone especially that Valentine's Day is looming around. For one, I love to have the red roses, chocolates and lovely dinner with my loved ones. 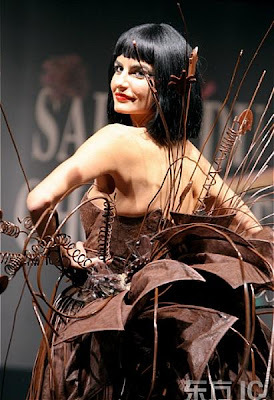 But, what if I get to have this chocolate dress for Valentine's Day? Geez, I shall surely pick on the stuff while wearing it. LOL! People wear stuffs in so many different ways. I must say these define their unique taste for fashion and personality, and perhaps their moods for the moment. The latter is actually based on personal experience and observation. Sometimes, when I feel that I am glad or something, I can just practically wear anything and they simply appear appealing. But, once the mood is gloomy, somehow, the taste just becomes poor and bitchy. Sigh! So, the punk and emo got their own fashion statements too. While I get amazed and disoriented by their styles, at least they express their emotions well. LOL! Fashion can be a release of stress and other pent - up emotions that others simply rely on vices and drugs among other things. Teenagers for one, get hooked to these easily that drug rehab can only be necessary. Parents, government organizations and other private institutions must continuously educate the society of this ailing predicament. In the Philippines alone, HIV - AIDS among the young ones becomes an alarming problem together with drug addiction. We can only be more responsible. When I was way younger, I envied my neighbors and classmates who had lovely Barbie dolls. And, since we did not come from elite family, we could only settle for cheap ones. But, still I fancy and adore them that if I have a daughter, I will sure pay my paycheck to get some Barbie stuffs. So, it is nice to know that Barbie is back with more styles and reasonable rates. Somehow, 50 years of Barbie make this name a household brand. In fact, my sister in - law who is into Barbie all her life is now buying Barbie stuffs for her year old daughter. You cannot really undo passion regardless of time or price tags. LOL! Click here to read the full article on Barbie. I have a young nephew who is turning two years old. He is quite the same with his elder brother since he too has a small frame unlike my big kid. My kid is of size 8 for kids when in fact, he is only seven years old. His structure does not help much since he is also a knocked - knee legged with quite big thighs while his cousin is only 1/3 of his weight. So, clothings that don't fit anymore are actually given to his cousin. Only that, he appears too small for his stuffs. Somehow, it is easier to buy children's clothing when they are tiny or something. They just come in abundant supply. Sometimes, I wonder if the weight of my kid was due to the fact that he was all bottle fed and that I hated best prenatal vitamin so I basically did not have much nutrients when I had him. If I remembered it well, weight can be affected by the reasons I stated above plus the lifestyle a toddler has. For my kid and nephews, they just have to wear what can be more comfortable for them while appearing all cute. LOL! I have been featuring Oliver Tolentino in two of my posts and now, this young designer has made us prouder again by being the lone Filipino designer to join the 2010 Oscar Designer Challenge as a one of the 10 finalists. Academy Awards or popularly known Oscar's recently identified Oliver Tolentino to this pricey challenge. He is the only Filipino who is based in the Philippines but had expanded abroad. He indeed is making his name more known to Hollywood. And as a Filipino, I can't help but be prouder. The awarding shall be during Oscar's pre - show and the finalists will unveil their entries on February 23. Also, their works shall be showcased on the Academy's website for online voting and appraisal. Today had listed 18 best female tattoos. I only knew that my personal fave Angelina Jolie has 13 while Victoria Beckham has a sweet Hebrew print of her wedding vow. The list includes Drew Barrymore, Megan Fox, and 14 others. I only love to see tattoos on other people but to see them on my skin, they simply give me creeps. I will settle then on henna tattoos to curb my liking. LOL! My kid and nephew had their assignment about weights. Their teacher required them to research on the heaviest living person and animals. So, we only felt obliged to search from the net. Of course, elephant and blue whales answered the second question while for the living person, Manuel Uribe of Mexico filled the other question. His weight was recorded to be 597 kg that made him fixated to his bed in 2001 until 2006. He however, lost 400 pounds in 2008 and was able to become mobile again. In 2009, he was falsely considered dead. His clothes are expected to be customized and movements are really difficult. Looking for big clothes is indeed hard especially for very obese people. Not to mention too that there are health - associated risks for this kind of problem. Good thing that Manuel Uribe had lost weight through the help of his doctors and nutritionists. He made a foundation in Mexico about educating against obesity and improper lifestyle. With vast numbers of fast foods and busy lifestyle, the number of weight problems simply increases. We can only redesign our way of life, diet, exercise, seek help from the experts or read from http://www.weightlosspills.net to address this concern. For my kid who is quite big for his age, most of his clothings are just handed over to his cousins since he wont fit in. He is quite cute but his weight does not. How wacky can you be? I can only settle for cute texts and sweet prints but to be wild and all on my undergarments, yikes!!!! 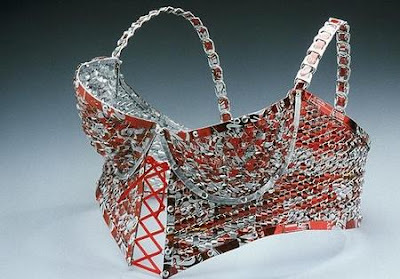 So, would you wear this Soda Can Underwear designed by Ingrid Goldbloom Bloch? According to her, this soda can stuff is as comfortable as any regular undergarment. Well, thanks but no thanks for this. I wish to try anything cute and cool but of course, I have to see if my taste and age can fit in. But, I saw the nice pictures of geek necklace designs and I must say, their artists are simply creative. The picture above is pretty awesome for an IT fanatic like me. 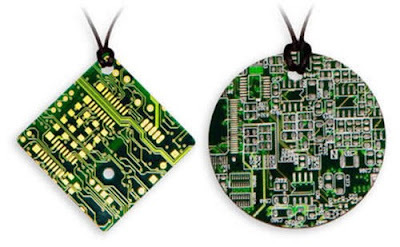 Any unused circuit board and other electronic stuffs can simply be recycled to a fancy and fashionable accessory. It is quite nice to know that people do recycle to help the environment. There are pretty cool reviews about gadgets and stuffs being redesigned so they can still be used and not be added to man - made wastes. Somehow, reviews like this and health - related like colon cleansing reviews do make Internet surfing worthwhile. I once featured recycled compact disks turned into a duffel bag and I just found it way amazing! Who says geek cannot be fashionable and eco - oriented? After a three - day midterm exam, I am back to regular work as a college teacher. This means I have to wear my usual casual attire, slacks and blouse and to sneak my wearing of pants during anything - attire - goes every Wednesday. LOL! But, I have been restless with stress from work, business and personal life. Gosh, being an IT teacher is not at all easy. I have to work on some programming assignments and resources so I can teach well the topic. This mean draining my brain out. The aftermath of this is always the presence of unwanted pimples. I have to at least try acne home remedies and my other medicine if they wont work to reduce the inflammation. So, in spite of my fancy - day fit, I am all worried with the stuffs on my face. Sigh! I can only rest well and relax more than I should. Grammy Award or originally called Grammophone Award which is given to outstanding performance of artists in the music industry. My personal faves are Beyonce who won 5 Grammy Awards including Song Of The Year, Best Female Pop Vocal Performance, Best Female R&B Vocal Performance, Best Traditional R&B Vocal Performance, Best R&B Song, and Best Contemporary R&B Album and Taylor Swift who earned four awards including Album of the Year for Fearless. She is the youngest artist to ever received the Grammy honors. But, I wont miss this award's night without citing who were worst and best dressed. Lady Gaga was at her usual unusual gear and so was Imogen Heap while Melody Thornton of Pussycat Doll do deserve an A grade. Click here to see more.